If you are planning on taking a gap year in Israel you will be faced with the choice between spending your time in Tel Aviv or Jerusalem. On Aardvark you will broadly have very similar options in each city, a wide range of study programs, gap year internships, interesting and diverse activities and more. The real question comes down to the character of each city. There are many stereotypes about the cities that have a lot of truth to them, broadly that Jerusalem is an ‘old’ city and Tel Aviv is a more ‘modern’ city. Each city has its own advantages and disadvantages but here are some of the Tel Aviv’s. For starters, it is largely true that Tel Aviv is the more modern city. Set on the shores of the Mediterranean Tel Aviv is a lively city packed with restaurants, cafes, bars, pubs, clubs, music venues, museums, galleries and much more. You will find a great city scene where there is always something going and never a dull moment. Furthermore, almost in direct contrast to this, Tel Aviv is also home to a large religious population. During your gap year in Tel Aviv you will be able to discover both sides to the city and this will give you a real insight into modern Israel and the issues that Israeli society faces on a day to day basis. Of course, just as you can’t talk about living in Jerusalem without mentioning the Old City, you can’t talk about Tel Aviv without the beach. For many the beach is Tel Aviv’s main attraction and it is certainly a huge draw to those hoping to spend their free time swimming and sunbathing. Along the coastline you will find numerous different beaches to explore each with its own character. 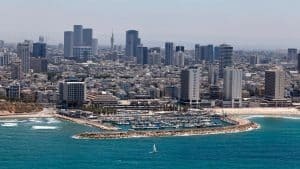 Another feature of Tel Aviv that will attract many, particularly those interested in internship programs in Israel, is that it is the focal point of Israel’s hi-tech scene. While there are hi-tech hubs across Israel, from the south to the north, a huge part of the industry is located in Tel Aviv. Not only does this present some fantastic internship opportunities, but if you get the chance to sit and chat to locals there is a high chance that some of them will work for a start-up or a well-established company and will be able to give you an insight into the industry. If you choose to live in Tel Aviv you will be confronted by all sides of Israeli society, from the hipster youth to those who have lived in the city all their life. Walking round the streets you will get a sense of contemporary issues through the graffiti and at the same time can immerse yourself in the more ‘highbrow’ aspects of Israeli culture by visiting art galleries and concert halls. Tel Aviv is by no means a city for everyone, but it is a truly unique place within Israel and offers an experience like no other.